UPDATE: Due to the threat of Hurricane Florence, all events scheduled at Chantilly Farm this weekend have been cancelled. 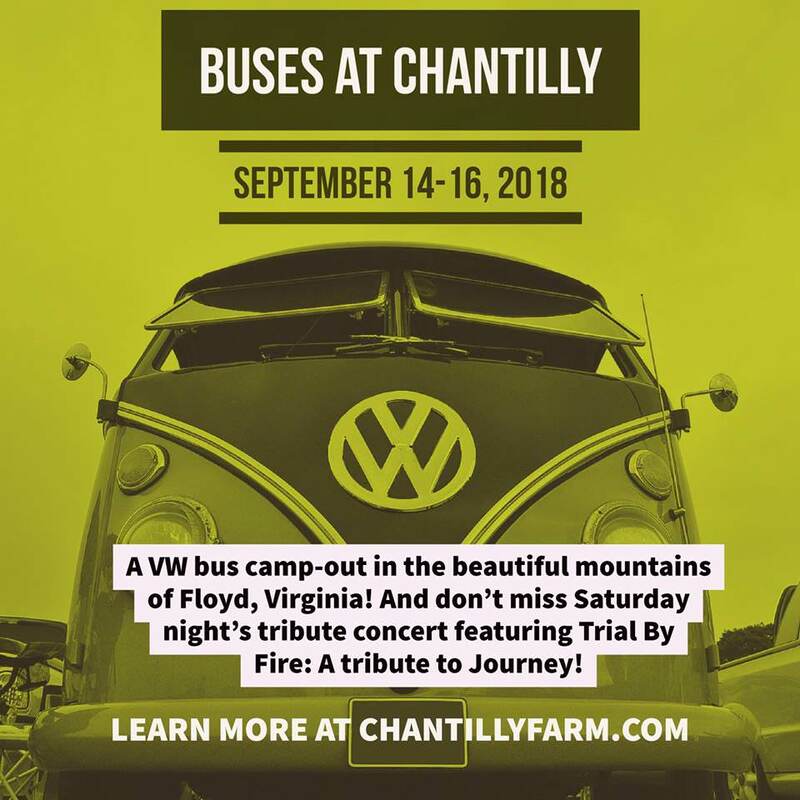 Chantilly Farm hosts the Third Annual Buses at Chantilly, A Volkswagen Bus Rally and Campout starting on Friday, September 14, 2018 through Sunday, September 16, 2018. Enjoy a Volkswagen bus rally and campout in the beautiful Blue Ridge Mountains of Floyd, Virginia coordinated by Floyd County’s own, David Wood! The cost is $10.00 per person per night with ages 12 and under are free. Nightly Volkswagen fees will be paid to David Wood upon arrival. Reservations are not needed. Please contact David Wood with Volkswagen Campout related questions at 540-808-6164. For full hook up RV sites, contact the Chantilly Farm campground at 540-808-4984. There is also a special Saturday night concert with Trial by Fire who is a premier Journey tribute band. VW Bus campers are admitted to the Saturday night concert tribute for free. Tickets to the concert are available for purchase for the general public. For more information on the concert, visit: http://www.nextthreedays.com/FeaturedEventDetails.cfm?E=482668. To view the event flyer, visit: https://i.imgur.com/Vi1NsHt.jpg. For more information, visit: http://chantillyfarm.com/ or https://www.facebook.com/chantillyfarm or call 540-353-5898 or email chantillyfarm@gmail.com.